I think this might break something. don’t do it. That ^ + magnet to monitor was a good strategy back in the days of CRT’s, and even then, Degauss sometimes un-“fix” it. do i have to delete both my sys32s, or just one? sys32 doesn’t exist on my system… what do i do? You can have mine, what is your SS#? I’ll do a DNS reverse lookup and mail it to you. Everything works perfectly now. Thanks NK!! BTW, I found that placing the largest magnet I could find on my hard drive actually doubles the speed of my internet connection. sorry, i don’t use a mac, either. Linux and B OS users will need to first do a hard format of their Motherboard’s Rom. Then install, in order, window’s 95, 98, NT, and Vista professional edition before following the steps above. Doing so automatically makes you machine a Mac, so when you go to the Genius bar and they deny you service, remember they lie. Linux users can do it quicker on the terminal; just type “rm -rf /” as root. 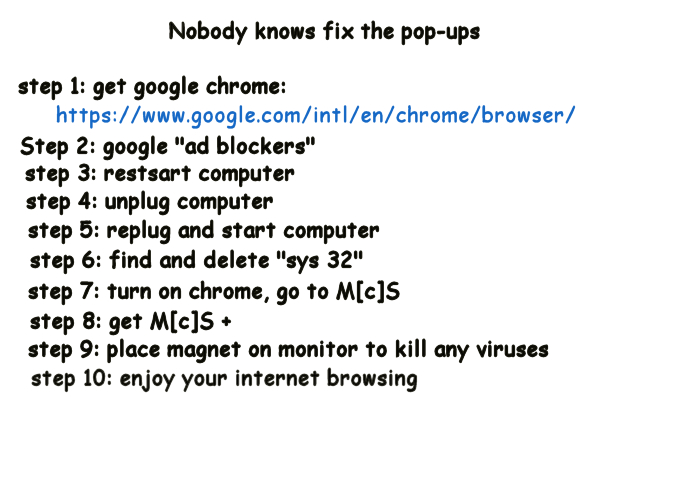 -“Nobody knows fix the pop-ups”… what? -Apparently step 2 needs a capital S. Not sure of the reasoning behind that. If only sexfacemagic was here to see this.